The Zspeed Active Stylus owered a 1.45mm special cooper material tip which is the finest tips in market now. The tip has a permanent service life, it's no need to change rubber tips and offers a smoother writing motion than a rubber tip. The Zspeed Active Stylus offer you seamless sketching and accurate signatures. Feel secure carrying it to the coffee shop or to the next meeting with its classic pen clip design. About the Stylus:Length:5.03" (128mm); Barrel Diameter:0.35"(8.9mm);Tip Diameter:1.45mm; Weight:11.5g -Made from stainless copper and steel, no plastic parts, real pen feeling. Perfect for note taking and sketching apps. Precise/ Sensitivity：It has a 1.45mm super fine tip gives you the accuracy you need and provides superior control and traction against tablet screens. It is made of copper that will last for a lifetime. Active stylus technology reduces off set and lag time between fine tip and trace, keep your tablet or phone screen free of finger smudges by using this stylus instead. Rechargeable & Stand-Alone：Built in battery provides 12 hours of active use and recharges by Micro USB cable (included). Stand-Alone active stylus design. NO Bluetooth or APP required. 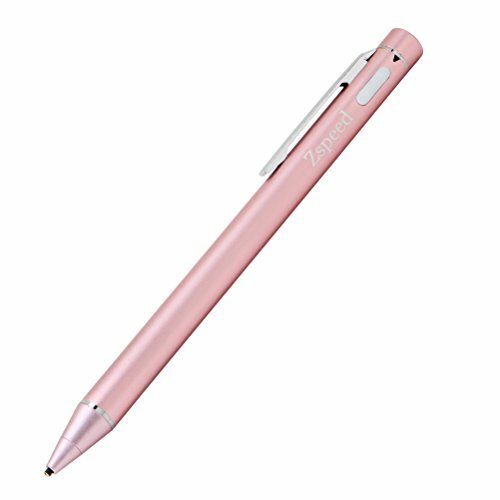 Fashion Design：Slim aluminum alloy body, fashion polish surface,USE AS A REAL PEN and makes sense for people with long nails or large fingers, when you have grimy hands, or when you are wearing gloves. If you have any questions about this product by Zspeed, contact us by completing and submitting the form below. If you are looking for a specif part number, please include it with your message. DotPen - World's Best Active Stylus Pen for iPad, iPhone, and Most Android Tablets and Smartphones. Machined Aluminum Housing With 1.9mm Durable Tip.